I wrote this post in our Big Bear hotel room on Saturday, but I couldn’t get my laptop to connect to the internet in Big Bear so I had to wait to post it until today. We had a great weekend there, but it’s nice to be back home where it’s (relatively) warm! Here’s a link to all of my Big Bear 2/25-2/27/11 photos. We made it back to the hotel! Around noon Dan, John, and Hudson found me at my table in the Summit Lodge and we all had lunch. They looked exhausted. They told me that there was so much powder that they sunk into the snow waist-deep in places! They said it was a lot like surfing. These kinds of conditions are rarely seen at Big Bear so they were very excited, but tired after five runs in about three hours. We had lunch in the very busy bar area (I had to fight to keep four chairs at our table until they got there). After eating and resting for a little while Dan and John decided they wanted to get in a couple of more runs before leaving, so Hudson and I stayed in the lodge and waited for them to get back. About 45 minutes later we were ready to leave Snow Summit for the day, but not after spending a good amount of time clearing my car of the four or five inches of snow that had fallen since we arrived. What a mess! I couldn’t clear the snow fast enough to keep the windshield clear. Eventually the defroster kicked in and melted the flakes when they hit, which helped a lot. After leaving Snow Summit we returned the rental skis to Leroy’s and then went in search of the Sugar Pine Bakeshop. I mentioned it to John and Hudson on our drive up yesterday and they were looking forward to trying it as much as I was. Well we found it, but there were no cupcakes in their display cases today! The ladies who own the bakery said they weren’t sure what kind of business they were going to have after the big snowstorm so they didn’t bother to frost any cupcakes today. There were lots of other goodies available so we picked out an assortment of those instead. So far I’ve only had a couple of bites of a cookies & cream filled brownie, and it was pretty tasty, but we have dinner reservations at 6 PM so I’ll save the rest for afterwards. The boys are napping right now and I’m sitting near the space heater with my laptop on my knees typing up this post. Too bad I won’t be able to publish it until we get home tomorrow because I can’t figure out how to get the hotel WiFi to connect to the internet. At least my WordPress app on my phone is working. I posted a couple of sentences that way via the AT&T cellular network this morning and I’m afraid that’s going to have to count as my daily blog update unless I find someplace that has better connectivity. With all of the writing I’ve done today, at least I have plenty to post when I get home tomorrow! I think it’s snowing again. Sheesh! We have to leave for dinner at Madlon’s, one of our favorite restaurants, in an hour and I just know the clean pair of jeans I’m wearing is going to get soaking wet from trudging through the snow by the time we get there. I just hope we can get out of the hotel parking lot tomorrow morning to drive home without too much trouble. 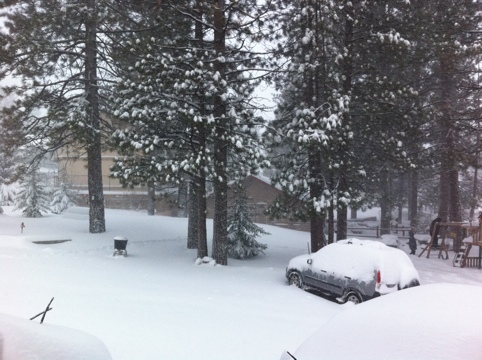 The parking lot was plowed while we were at Snow Summit this morning, but a lot more snow has fallen since then. As nice as it is up here in the mountains, I will be glad to go home tomorrow. We’ve rarely need an ice scraper in Big Bear and we’ve never needed a snow shovel before, but after this weekend I’m bringing both on all of our trips. OK, time to go finish getting ready for dinner. It’s going to be great! I wrote this post while hanging out at the Snow Summit lodge yesterday, but I couldn’t get my laptop to connect to the internet in Big Bear so I had to wait to post it until today. We had a great weekend there, but it’s nice to be back home where it’s (relatively) warm! Part 2 will be posted tomorrow. What an ordeal we’ve had this morning. I feel kinda guilty writing about how difficult it was to get from our Big Bear hotel to the Snow Summit resort this morning because Dan, John, and Hudson did all of the hard work to make it happen! But now they’re finally on the ski slopes and I’m sitting in the lodge saving them a table for lunch. But let me back up and start this story at the beginning. I’m a terrible snowboarder and after four years of trying to get better I finally gave up on it. This has made Dan’s snowboarding trips few and far between. So back in January I decided that I wanted to give him a weekend trip to the mountains for his birthday since he doesn’t get to go as often as he’d like. And so that Dan wouldn’t have to snowboard alone I invited our friends John, Hudson, and Dave. They weren’t free to go to Big Bear the actual weekend of Dan’s birthday, but we decided that weekend of February 26th and 27th would be work for all of us. So I called the Honey Bear Lodge, a hotel we’ve stayed at before and liked, and booked a room for five people that weekend. Everything was in place. Then Dave hurt his back and decided that there was no way he could come with us, even just to hang out of the weekend, which was a real bummer. So it was down to four of us. And then we got the weather forecast. Not only was a storm front coming through Southern California on Friday/Saturday, but Los Angeles was going to have some of its coldest days in a decade! That meant lots of snow in the local mountains and cold enough temperatures to keep it from getting icy on the slopes. The boys were very excited about the promise of good conditions and it looked like we had picked the perfect weekend for our trip. John and Hudson met Dan and me at our house yesterday and we left for Big Bear at 6 PM. We made surprisingly good time for a Friday evening – until we got stuck on CA-18. First let me explain that the road we usually take into the mountains has been closed all season due to storm damage last year, meaning that we had to take a longer, unfamiliar route to Big Bear. So when the traffic suddenly stopped moving, I looked on the CalTrans website to figure out what was going on. Sometime after we left the house, the status of the CA-18 was updated to make tire chains required from Panoramic Point to the Big Bear Dam. Since I didn’t know where Panoramic Point was I looked that up next. Turns out that was exactly where we were stopped. It was raining pretty steadily at that point (not quite cold enough for snow yet) and none of us were excited about the prospect of getting out of the car in those conditions to put on chains. Fortunately there are some enterprising folks who charge $40 to put the chains on for you. Even at twice the price that would definitely have been the way to go. I highly recommend carrying at least that much cash if you’re driving up to the San Bernardino mountains because it’s worth every penny. Once Dan flagged down one of the guys it only took him about five minutes to earn our $40. It was fantastic. Unfortunately we were still a long way from Big Bear when we were chained up and ready to go. Our goal was to make it into town before 10 PM in order to rent skis for John and Hudson and be able to get a meal from somewhere other than Denny’s. We made it with fifteen minutes to spare, meaning that our entire trip took about four hours. We’ve definitely had worse drives. We got the skis from Leroy’s and surprisingly found Paoli’s Italian Kitchen still open in the Village for dinner. We had some delicious pasta there, which was an unexpected treat because just about every restaurant in Big Bear closes at 10 PM. By the time we got into our hotel it was 11:30 PM and we went to sleep shortly after that. Dan’s alarm went off at 6:30 AM this morning to give us enough time to get ready and make it to Snow Summit before the slopes opened. But then we looked out the window and realized that leaving our hotel realized wasn’t going to be a simple proposition. I walked out to the car with Dan in about a foot and a half of fresh snow (which is not really a good idea in jeans because when you go back inside the snow melts and your pants are soaked) to get the car started and brush off the windows. Then one of our fellow hotel tenants in a huge truck (but without chains) tried to drive out of the parking lot, but he only made it about a car’s length before he got stuck. Yikes. At this point I retreated back into the room, leaving Dan, John, and Hudson to the arduous task of helping to get that truck out of the parking lot so that we could follow in his tracks. That took about an hour and a half, poor guys. I felt so guilty sitting in our warm room while they were out there working hard, but I figured I would have been more of a hindrance to them than a help. And I would have been miserable out there considering I hadn’t dressed appropriately for the weather (Why didn’t I bring my snowboard pants and gloves?) and my griping certainly wouldn’t have helped them at all. Eventually that truck made it out of the parking lot and we were able to follow them out onto the freshly plowed roads. (Apparently the truck owner kept doing stupid stuff, getting their truck even more stuck in the snow. It’s a good thing Dan, John, and Hudson were there to help out or they would have been in a lot of trouble! Hudson said they sounded like Hawaiians!) It still wasn’t easy for my CR-V to get out of the parking lot because it has less ground clearance than the truck, but we made it out without too much more effort. Phew! We got to Snow Summit around 9 AM, I picked up the lift tickets that I had pre-ordered for the boys, and now they are out enjoying the newly fallen snow. Hopefully our drive home tomorrow won’t be as eventful as the last 16 hours have been! I heard that the snow was going to stop sometime this morning, and as I’ve been sitting here it did. For a while. Now it’s snowing big fat flakes again. I’m glad to be fairly warm here in the lodge and I hope the boys are having a blast on the slopes. My plan for today was to go back to the hotel at lunchtime to take a shower and relax until they were done skiing/snowboarding for the day. Also, I want to go to the Sugar Pine Bakeshop down the road and get some cupcakes to celebrate both Dan’s and John’s birthdays (belated, but still a good reason to eat cupcakes). However, there are two problems – 1) I’m not sure I want to give up our space in the main parking lot, and 2) I’m terrified to try to drive into the hotel parking lot again! I guess I could call and see if they’ve gotten a snow plow out there yet, but not being very experienced at driving in snow means I have no idea what to do if I get stuck in the snow. We’ll see how the boys feel when they come back to the lodge for lunch. So our hotel seems to have WiFi, but I can’t get my laptop to successfully connect to any websites. I’ll post later with more information. And pictures! It snowed so much here last night! When I heard about this week’s devastating earthquake in New Zealand I was shocked. 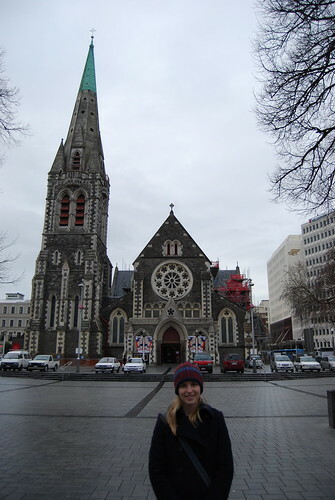 Christchurch is such a beautiful city and it has weathered so many other earthquakes in the past. Unfortunately this one was different. 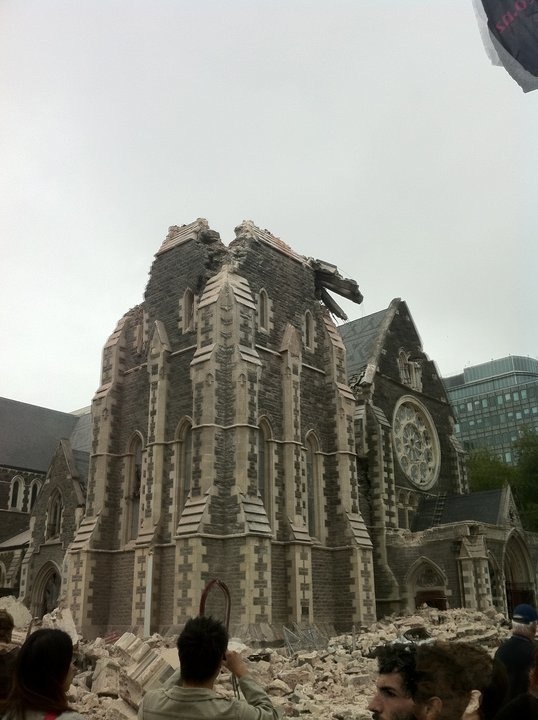 I was blown away when I heard about the Christchurch Cathedral collapsing. The photo on the left is from our first trip to New Zealand, when Dan and I were on our honeymoon. And the photo on the right is one that’s been circling the web since the earthquake. I can’t believe this happened. It was such a beautiful church. My heart goes out to all of the families affected by this natural disaster. I don’t have a specific subject in mind today so I’ll write about how I’ve been spending my week. After work on Monday I drove down to Irvine to pick up Bryon from the hotel where he was staying on his business trip and brought him back to our house. Dan, Bryon, John, and I went to dinner at Mediterraneo at the Hermosa Beach Pier that night. It’s a tapas restaurant that has delicious food, and a selection of beers that Dan really appreciates. It was a good meal with great company. I stayed up too late that night, though, and getting up for work the next day was hard. The boys went golfing with Jim and Mike on Tuesday, which was the cause of Bryon throwing his back out. Actually, from what I’ve heard, he didn’t hurt his back swinging a golf club, but jumping a fence instead! Although Bryon wasn’t doing too well after that, it didn’t keep Dan and him from going to the shooting range after golf. I was hoping to serve all of the leftovers in the fridge for dinner (yummy skillet lasagna and Thai chicken pizza), but they ate Carl’s Jr. instead. How am I ever going to get the fridge empty enough to justify cooking another meal? I am dying to try another new recipe! I forgave them, though, because we watched the newest episode of “Top Gear” when they got home. One of my favorite shows. On Wednesday Dan and I both had to go to work so Bryon was left to his own devices at the house. I think he watched TV all day, poor thing. Our house isn’t in a very exciting location, especially when your back hurts too much to walk anywhere. When I got home from work he was watching “Meet the Robinsons” on Disney Jr. Thrilling! I ordered the three of us some dinner from Havana Mania, a Cuban restaurant near our house that has awesome food. The boys both got lechon cubano (Cuban pork) which is probably the best thing on the menu, but I got a sampler plate just to be different. Not only did I get to eat some of the delicious pork, but also sauteed chicken, black beans and rice, sweet plantains, and ham croquettes. It was all amazing. I could eat a whole plate of those sweet plantains and I never would have ordered black beans and rice by itself, but I couldn’t believe how tasty it was. Wow. While Bryon was visiting us we watched two Laker games, both of which Los Angeles won. Dan and I decided that Bryon was good luck and we were reluctant to let him leave to go home! Last night’s game against the Trailblazers was a blast to watch. The Lakers managed to come from behind and tie the game, forcing overtime, which they then won decisively. It was amazing. I haven’t cheered that much since Florida beat Georgia in overtime during last year’s college football season. When the Laker games start at 7:30 PM I usually don’t stay up until the end, but I’m so glad I didn’t miss any of last night’s matchup. It’s great to see the Lakers playing inspirational basketball. Bryon flew back to Texas today and I finally got to serve the leftover pasta and pizza for dinner. The Thai chicken pizza was actually better today than it was when I first made it! Unfortunately I won’t get a chance to cook another meal until at least Monday because Dan and I are going to Big Bear for the weekend with our friends John and Hudson. It’s a belated birthday celebration for both dan and John. We’re leaving to drive up there after work tomorrow. It’s supposed to snow in the mountains this weekend so hopefully the guys will have good conditions on the slopes. I’m going to be curled up with somewhere with my laptop and a cup of hot chocolate so I know I’ll enjoy myself. I need to start packing tonight, but that’s going to have to wait until the laundry is done. So I’m going to go work on that now. I’m looking forward to a great weekend! I heard Whitney Houston’s “The Greatest Love of All” on the radio as I was driving to work this morning and it really took me back. It’s been years since the last time I heard that song, but I remembered all of the words and all of the notes as I was singing along. This is really going to date me, but that was one of my favorite songs when I was a kid. It was released in 1986 (on vinyl, no less) and it was so popular that it was the last song that our local roller skating rink played before closing for the night. If you grew up in Tallahassee, you’re familiar with Skate Inn East. It was the place to be on Friday nights before you got your driver’s licence (I was 15 the last time I went). I went to a lot of birthday parties there over the years. I never won a rabbit’s foot doing the Hokey Pokey, but I always went out there and made a fool of myself trying. It was lots of fun, even though I was one of the world’s worst roller skaters. I never did quite get the hang of braking with my toes. Running into a wall was always more effective. The last song of the night at Skate Inn East was always played with the overhead lights off, the strobe lights flashing, and the disco ball twinkling, and “The Greatest Love of All” was no exception. Because I loved the song I always skated when it was played, even though the strobe lights usually made me fall down. That didn’t stop me from singing at the top of my lungs, trying to drown out Whitney herself. I was a diva on roller skates! Hearing that song on the radio this morning brought back some great memories of my childhood in Tallahassee. I miss my hometown! When I hit publish on this post I will have updated my webpage every day for the first 53 days of 2011. Pretty impressive, huh? I think so, but I keep wondering how long I’ll be able to keep it up. So far this year I’ve written plenty of posts while away from home (Disneyland and DC), but I’ve been able to count on WiFi at my hotels in all of those cases. I figured my biggest obstacle to posting every day was going to be on my trip to Florida next month (no guarantee I’ll have internet access at our hotels in Tampa and Orlando), but it seems I am going to face my first one a little earlier. Big Bear Lake. I’m taking Dan and a few of his friends to Big Bear this weekend for a belated birthday snowboarding trip and accommodations in that particular mountain town are a bit more rustic than other vacation spots. I booked a room for five people at a nice place where we’ve stayed before, but I didn’t think about whether or not we’d have internet access. Turns out we probably won’t (based on my research, which includes everything except actually calling the hotel and asking them). So it looks like the only way I’ll be able to update my webpage via my laptop (my usual method) will be a trip to Starbucks. That is, unless Snow Summit has finally entered the twenty-first century and installed WiFi in their lodge. Not likely, although it would make the hanging-out-in-the-lodge-while-your husband-snowboards experience much more pleasant. (You can’t beat the Snow Summit hot chocolate, though. So delicious.) I did figure out how to get my WordPress app working today, but combining my atrocious iPhone typing skills with a lack of patience is going to make that a last resort. I’m not going to let limited internet access keep me from updating my webpage this weekend, though. I haven’t made it this far in 2011 without missing a day to stop now! I’m crossing my fingers that our hotel does indeed have connectivity (even if it’s not WiFi), but otherwise I’ll buy some hot chocolate at Starbucks and write a couple of webpage posts there. I’ll let you know what the situation is when we arrive in Big Bear on Friday night. Until then I’m going to take full advantage of our home WiFi. I love technology! I don’t have much time to write today since Dan’s brother is here for a visit, but I do want to make sure and document the recipe for the delicious red velvet brownies that I made last night. I started with a recipe for red velvet cheesecake brownies that I made as my fifth new recipe this year, but eliminated the “cheesecake” part. I just make the “brownie” part by itself this time and it turned out great! I think I may have over baked them a little because the edges were a little crunchy, so next time I will test them after 25 minutes, but the taste is outstanding. To finish them off, I used what ingredients I could find in my kitchen to make a small batch of cream cheese frosting – 4 oz cream cheese, 2 Tbsp butter, 2 c powdered sugar, and 2 tsp vanilla – and it turned out brilliantly, even though the consistency of the frosting was a little runny because I ran out of powdered sugar. My mouth is watering just looking at this picture! So delicious! Now, if you’ll excuse me, I’m going out to dinner with Dan and his brother. In a small, heatproof bowl, melt butter and chocolate together (1 minute on HIGH worked for me). Stir with a fork until very smooth. Set aside to cool for a few minutes. In a large bowl, whisk together sugar, eggs, vanilla extract, and red food coloring. Add in the chocolate mixture and stir until smooth. Add the flour and salt into the bowl and stir until everything is just combined and no streaks of dry ingredients remain. Pour into a lightly greased 8″ or 9″ square, lightly greased baking pan and spread into an even layer. Bake at 350 deg F for 25-30 minutes, until a toothpick inserted into the middle comes out clean. Serve warm, or cool in the pan completely before frosting. 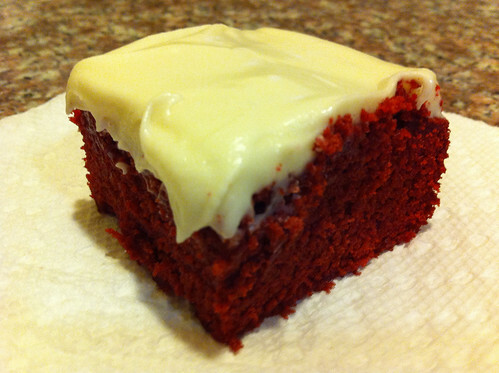 Based on Baking Bites’ Red Velvet Cheesecake Brownies. I mentioned back in December that Dan and I bought ourselves a table and chairs as Christmas presents this year, and yesterday they were finally delivered! We didn’t know exactly how the new furniture was going to look until it arrived because when we went to the Ethan Allen showroom to pick them out, they didn’t have the table we wanted in stock. And it was really hard to picture what the chairs were going to look like with just a swatch of the fabric we chose to look at. It took some imagination, and quite a lot of trial and error with the fabric, but Dan and I are both very pleased with how the combination turned out. 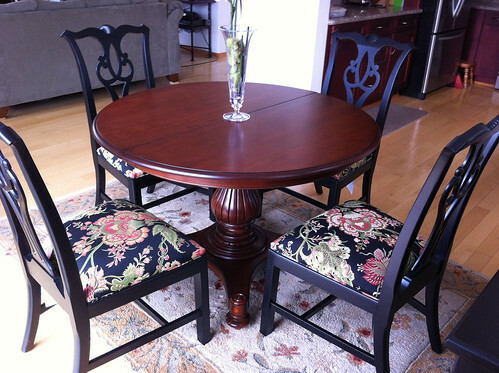 Because we already had a mix of dark brown and black furniture in our downstairs living area (which is pretty much just one big room, including the kitchen), we decided to get a reddish-brown colored wood table and black chairs with a bold floral pattern. The items we’ve brought back from our trips to New Zealand and Hawaii have established our decorating style as “Pacific Island” and we thought that the bright floral pattern fit into that category perfectly. And seeing how everything looks together, we were right! Dan hung a bunch of new photos and paintings on the walls over the holidays, and they add the perfect touch to our living room. It looks fantastic and I love it. The Ethan Allen consultant was very excited when we said we wanted to mix colors. I don’t think she gets too many creative clients given that Ethan Allen is such a conservative brand. Dan and I wanted to make sure we were buying quality furniture and fortunately you can modernize Ethan Allen by mixing and matching from different collections. Needless to say, we are very satisfied customers!